I’m not exactly sure when children decide to drop that morning nap and resort to just one nap a day, but truly I thought I’d have a little bit more time to prepare for this. Carol said last week he’s down to napping for less than an hour in the morning. All weekend, well let’s just say he napped for maybe two hours during our vacation. Obviously it’s a new environment, but even at my parents on Thursday morning he didn’t nap that long. The wean seems to be coming. I’m okay with it, I think, as long as he continues to take an awesome nap in the afternoon. If he’s going to be one of those kids who stops napping all together, he’s definitely for sure getting a cage. Seriously, how else am I supposed to get things done? Nap time is crucial!! Maybe that’s the time I start teaching him how to fold laundry or strap a swifter pad to his knees! It’s not child labor if they’re having fun. 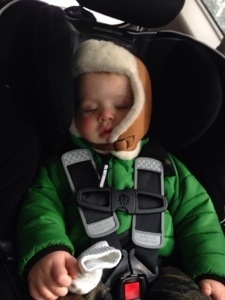 Our attempt to get the grouch monster to nap yesterday resulted in a ride to the grocery store. Best nap all weekend. If only when they helped it didn’t usually create more mess! I wouldn’t stress, once they drop down to the one sleep they generally have a much bigger sleep. Fingers crossed for you! Oh the loss of the morning nap is a sad time. I remember it so well, it took me and Jack a long time to get into a new groove. He had trouble adjusting to just one nap and so did I. Good luck! !